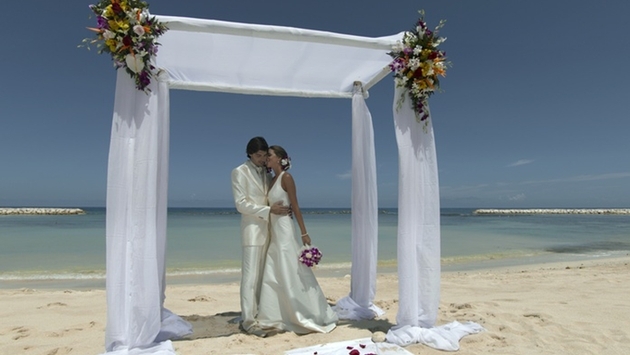 FILE PHOTO: Couple getting married on the beach at Grand Palladium Jamaica. Jamaica tourism officials welcomed the country’s two millionth overnight visitor of 2013 at Montego Bay’s Sangster International Airport Sunday, marking the first time the Caribbean nation has ever recorded as many as two million annual visitors. Newlyweds Craig and Alexis Grenier were welcomed by Wykeham McNeill, Jamaica’s tourism minister and other government and Jamaica Tourist Board officials. In reaching the milestone, Jamaica has established itself as “a major center of hotel development, to the extent that our hotel developers have been successful at developing international brands that have driven growth here at home and in several other places in the region," said McNeill in a Jamaica Observer interview. Elizabeth Brown Scotton, chief commercial officer of Sangster Airport operator MBJ Airports Limited, said the airport has recorded “double-digit growth” since August and the facility will handle 3.6 million passengers in 2014.